Last week Mrs May announced that agreement had been reached between the EU-27 and the UK on the UK’s withdrawal from the EU. She then persuaded her reluctant Cabinet to agree to support it, and lost rather fewer ministers through subsequent resignations than some expected – though those resignations did include Dominic Raab, the Brexit secretary, giving us the odd sight of a Cabinet minister resigning straight after the Cabinet had agreed to support his Department’s main policy. The deal consists of a legally binding treaty covering the actual withdrawal and a joint declaration by the EU-27 and the UK outlining in broad terms the shape of the future relationship between the two, the details of which will be thrashed out over a 21-month transition period after the UK formally leaves the Union next March. The EU-27 will discuss the agreement at a special summit on 25 November. The expectation is that it will be approved: the EU have shown great faith in Michel Barnier’s negotiations and the agreement, while not ideal for them, gives the EU most of what they really want and crucially is acceptable to Ireland. It is unusual for the interests of one member state to dominate the EU’s decision-making process – the EU usually try to avoid being in this position. But in this case Ireland has in effect secured a veto over the whole deal. Right at the start, and before anyone was really focused on the issues, the Republic demanded that whatever the position of the general EU border with the UK, there be no border between themselves and Northern Ireland. The EU agreed to support this demand without really thinking it through – Ireland also played heavily on the card that “you owe us one after we paid to rescue the German banks from their foolish lending” – and now, despite the difficulties that keeping the Irish border open causes both the UK and the EU, they feel they cannot back down. It is what happens after that that is less clear. At some point in December Mrs May will present the agreement to the House of Commons, who also have to approve it. And this is much less certain to happen; indeed, as the arithmetic stands at the moment, the Government is well short of the required votes for it to be passed. Mrs May has two main tactics. The first is to hope that as the EU approves the deal, and as leaders of business and industry (many of whom are very fearful of the consequences of no deal) talk up the agreement as the only way of avoiding chaos, momentum will build behind it. And secondly she is already claiming that the choice is between her deal, leaving with no deal or, in a clear threat to potential Brexiteer rebels, possibly not leaving the EU at all. It is a measure of how unattractive the deal is that Mrs May has had to resort to such arguments. Few commentators consider that the agreement she has achieved is actually good for the UK – it leaves too many continuing ties to the EU for many, and has been christened by hard Brexiteers as the BINO option, or “Brexit in name only”. And it still has the potential to separate Northern Ireland from the rest of the UK in due course if there is no other solution to the Irish Border question, something that all but guarantees that the Democratic Unionist Party will vote against it, thus costing Mrs May her majority in the House. Given the UK’s weak negotiating hand, and the complications of the Good Friday Agreement, this was however always the likely outcome, and it is not easy to see how any process involving negotiation and compromise with the EU-27 could have ended differently, especially after the EU had adopted Ireland’s stance. More generally, the challenge is that Brexit is a uniquely binary matter in which finding common ground between two radically different viewpoints of the UK’s future for the British electorate to coalesce around is very difficult, as any compromise outcome will inevitably disappoint and frustrate all sides, both those who wanted the UK to stay in the EU and those who voted to leave. As is duly happening – Remainers claim that the agreement is worse than being a member of the EU and Leavers claim it is worse than fully leaving. And both sides are probably right. The hole Mrs May is in, and is proposing to put the UK in, is without doubt pretty unattractive. 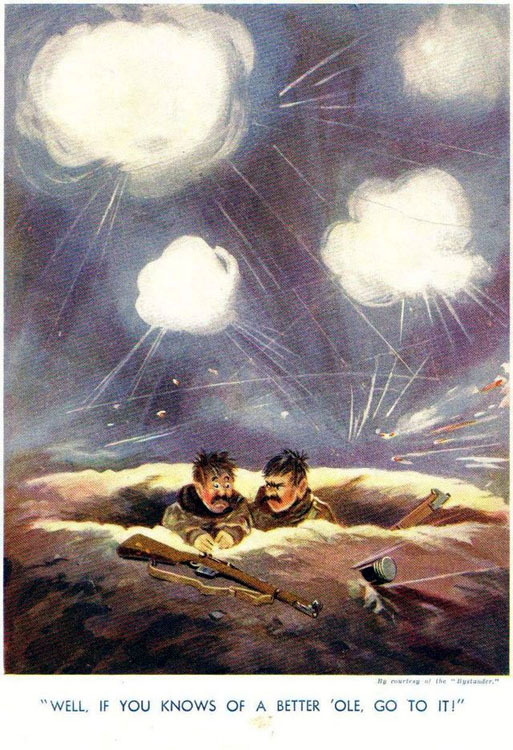 Indeed, at the end of a week that has seen the world mark the end of the Great War a hundred years ago, her predicament brings most to mind this cartoon by Bruce Bairnsfather, possibly one of the best known cartoons from that time. And just like the poor Tommy in the hole, Mrs May is surely entitled to ask her opponents if they know of a better one. It is incumbent on every MP who is considering voting against Mrs May’s deal not just to explain what they do not like about it, but also what they would do instead. Not what they would wish for in an ideal world, but what they would actually do in the real world of ticking clocks, intransigent EU negotiators, Good Friday Agreements, economic realities and a (still) totally divided and unreconciled electorate – where the political class, of all stripes, has abjectly failed in its duty of leadership and finding a path to national reconciliation. That MPs have still not grasped the reality of Mrs May’s, and the UK’s, position is shown by the ultimatum at the end of last week from some leading Tory Brexiteers that in return for their support, she must return to Brussels to “demand a renegotiation” of the agreement. Nothing is impossible in politics, but the concept of Mrs May demanding such a rethink, and even more the prospect of the EU conceding it, would seem remote – there is weariness on both sides of the Channel with the whole process and a desire simply to finish it. Nor are the Labour party being any more realistic, with their position of voting against Mrs May’s agreement on the grounds that it is “not as beneficial for the UK as the EU membership we are giving up”. This has been the sum total of the party’s contribution to the debate in a period of over two years – they have put forward nothing more positive in all that time – but since it has been the driving principle of the EU-27 since the very start of the negotiations that non-membership cannot be as beneficial as membership (or they would face a queue of countries seeking to leave), it is hardly a constructive position. The Labour party’s true position is they want a general election because they expect to win it and they want power more than a good outcome for the country. They are therefore not interested in anything constructive or in the national interest which might delay one. The collective failure of the British political class to put the nation’s interests above their own narrow party interest in the last few years has been striking. From Cameron risking the country’s future in an attempt to solve a domestic row between two wings of his party, to Corbyn’s complete inability to think constructively, co-operatively or coherently on the matter, to the Liberal Democrat’s astonishing position of having only one policy anyone knows about (viz, that leaving the EU is a bad idea), having 50% of the country agree with them and still only polling well under 10% in the national polls – surely a failure of political effectiveness that calls into question their very existence – it is hard to think of a time where collectively the 650 MPs in the House of Commons have served their country quite so poorly. So the odds remain that while the EU-27 will on their side approve the deal relatively quickly, Mrs May will struggle to get it through the House of Commons. If she fails, it threatens a major constitutional problem. The House of Commons operates on the principle that the Government proposes an idea, and the House then either approves it or rejects it. That works most of the time because rejecting a government proposal implies that the status quo ante stays in place, and that is usually a viable position. But it does not work when the status quo is not an option, as we have now: the Article 50 clock is ticking, and absent any other arrangements, on 29 March next year the status quo, ie the UK’s membership of the Union, will end. In such a situation the Government has to get agreement to something, because doing nothing and staying as we are is not an option. But for any given something, be it Mrs May’s laboriously crafted plan, or Remain, or a Norway-style deal, or a Canada-style free trade agreement, or asking the EU for an extension of the Article 50 process, or even crashing out of the EU with no deal at all, there is an outright majority in the House who would vote against it. And if the House cannot agree on anything? At this point, we enter – as the old maps used to put it – “Terra Incognita”. A Conservative party leadership election would look inevitable, and after that a general election is possible, or even another referendum (which would cause its own problems). But none of these can happen overnight, and meanwhile the EU has its own ticking clock, as the European Parliament elections are due in May 2019, and if the UK has not managed to leave the Union by then, it could even theoretically claim the right to take part. Which the EU seriously does not want to have to contemplate. There is a long way to go yet before Britain’s future relationship with the EU is settled.